ス The Lead Wind Blows! 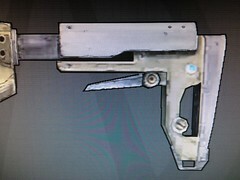 Lascaux 無 The gun of the Bulls. Commerce 雷 I have a Soldier a Siren, two Scooters and a Claptrap. ス in Spain, stays mainly on the plain. Good Touch 炎 ...but when I'm bad, I'm better. ス In. Not unlike Errol. ス Have I achieved worth yet? Crit 雷 Slippery when wet. 銃のアクセサリがない場合、接頭辞が Miss Moxxi's になる ミッション報酬：クリティカル ファンブル! Yellow Jacket 雷 By the people. For the people. ス you know... for him. ス Who's a widdle gunny wunny. ス Counterbution revengence. The reckoning. ス If thou'st would'st snitch'st, acquire thine stich! ス We need to talk about your DPS report.